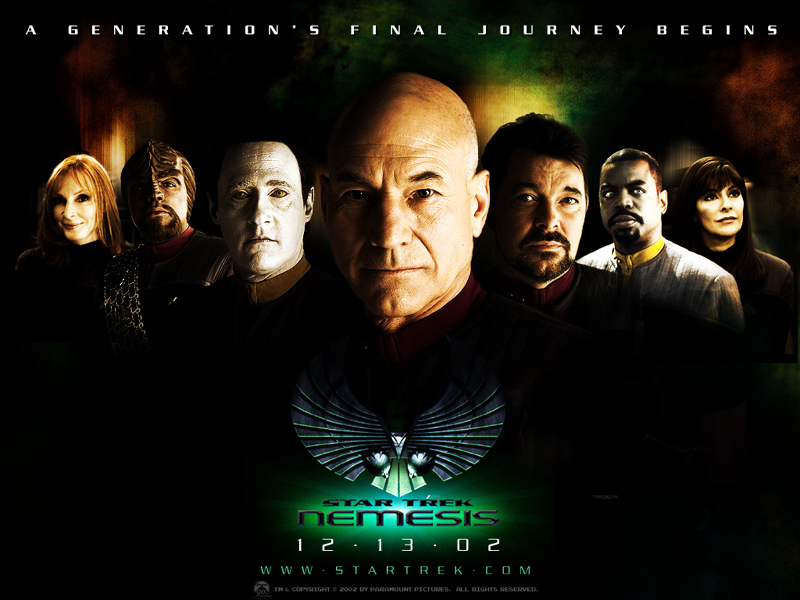 My Star Trek: The Next Generation film flashback series concludes with a look at the “generation’s final journey”, Star Trek: Nemesis, which was released 12 years ago tomorrow. The film was dropped into a very crowded 2002 holiday movie season, with other franchise releases including Harry Potter and the Chamber of Secrets, Die Another Day and (just five days after Nemesis) The Lord of the Rings: The Two Towers. Because of this, and a general increasing antipathy towards Star Trek at the time, Nemesis suffered the dubious distinction of becoming the lowest – grossing film in the franchise and not even debuting at #1 on its opening weekend, as every previous film had done prior to its release. It was beaten by the extremely forgettable Jennifer Lopez vehicle Maid in Manhattan, and disappeared from theatres quickly over the course of the holiday season and New Year into 2003. In the fall of 2002 I was a freshman at Hampshire College and (once again) increasingly excited about that year’s Star Trek movie. I was confused as to why the film was already being marketed as “a (the next) generation’s final journey”. Why had Paramount already decided to phase out my favorite cast? Surely the studio was being overly judgmental. The original cast had not faced that same tagline when The Undiscovered Country was released in 1991. There was a modest amount of pre – release buzz, and at some point I got my hands on a promotional CD that included the above image, and so I made it the backdrop on my computer for a time. Thanks to a plan to tag along with my mom on business trip she would be making to Los Angeles, I was also VERY excited that I’d be seeing the new movie IN HOLLYWOOD not far from where The Next Generation was filmed ON THE OPENING WEEKEND of the new movie at the world famous Grauman’s Chinese Theatre, home of many celebrity handprints, unique architecture, and with Hollywood Boulevard right at its footsteps. Nemesis had its world premiere there on December 9, just three days before we arrived in town. It was my first time in California, and I was awestruck by the palm trees and glamour. I also had no idea of the prominent role the state would eventually play in my life, with two encore visits in January 2004, additional teasers in the fall of 2006, and then a whole new and vibrant life starting in early 2008 and continuing in a modified form today. And so once Friday the 13th rolled around, we worked our schedule out so that we (I) could attend an opening day matinee of the new film. We had swung by the theatre with some of our hosts the night before to see the area and the then-new adjacent Kodak Theatre, home of the Academy Awards. Our host sent us some digital pictures from that evening, but I think they have been lost to the sands of time and the rapidly evolving digital age. Needless to say, it was eye-opening for this kid from New England to finally see the bright lights of Hollywood Boulevard, with a surprisingly grungy feel clearly visible not far from the main tourist sights. I’m sure I was quite insistent that we had to make the matinee on time, even though we were coming from Culver City over to Hollywood on one of those so close but so far LA trafficked afternoons, and we did. We sat near the back of the auditorium so as to get the whole Grauman’s Chinese experience, with its lush red velvet seats, intricate aisles and large, but not enormous, cinema screen. I’m sure the surround sound was up to the current standards of the time. The cast looked noticeably older, four years after their previous voyage with Insurrection. A sense of finality pervaded the atmosphere, with dark tones around the screen. Oddly, the early moments of the film also included several out of character moments, most egregiously seen when Picard, Data and Worf stop the whole plot to go for a car chase, which leads them to a heretofore undiscovered clone of Data (even though another “brother” android had become well-established during the run of the TV series) and it figures prominently in the plot, alongside a mysterious and clearly villainous Romulan man, played by a then-unknown British actor, Tom Hardy. Oh, and longtime on-off couple Will Riker and Deanna Troi GET MARRIED, with a short wedding scene briefly drawing Wesley Crusher and Guinan back with their old crewmates. The plot uncomfortably mirrors Trek’s best cinematic entry, The Wrath of Khan, and I’m sure I noticed some allusions on that first viewing. Mainly I wanted to spend more time with my favorite Trek characters and take in the experience of the movie. This “family” feeling made the film’s ending, when android Data sacrifices himself for the good of the crew, come as a brutal shock, and actually made me cry in the theatre, since my favorite character was gone. It seems a little silly to think about now, but it was devastating to know that iconic character was gone. I got over it, and in spite of the movie’s poor box office and my mixed impressions, I saw it again two more times in the theatre. The first time was less than a week later with my dad, back in Boston at the Fenway Theatre’s largest screen. It was obvious the film would be bumped from all the showplace screens with release of The Two Towers the next day. I don’t recall my specific impressions from that viewing, and the third time around, in early January 2003 at the Cinemark in Hadley, MA, stands out clearer. By that time it was clear the film had not been a hit and would put Trek into a downward spiral. And yet, watching it again, I felt appreciative to see my favorite characters have another adventure, and spend time with them, again, like being part of a family. In subsequent years I have rarely revisited the film, but writing about it makes me curious to do so at some point. In the mean time, the cast has often gone on record about their dislike of director Stuart Baird, who was hired by Paramount with no knowledge of the television series, and contributed greatly to the film’s focus away from established canon and roles. Looking at the film now, it is undeniably unfortunate that The Next Generation crew’s journey ended with such a thud. They still deserve one last adventure, the series has enjoyed renewed interest since its 25th anniversary two years ago, and the cast members still are fond of each other. The sky’s the limit.